Our ancestor, the Cro Magnon Man is the earliest known modern man, Homo sapiens sapiens, and they lived from about 45,000 to 10,000 years ago in the Upper Paleolithic period of the Pleistocene epoch. 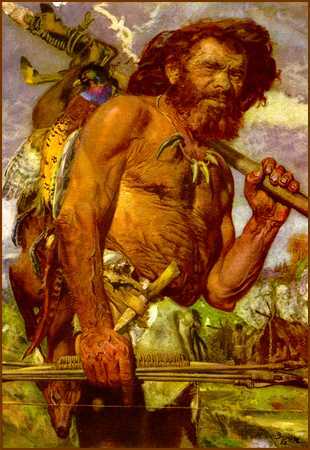 The Cro Magnon man is named after its first findings, they were discovered by Louis Lartet and Henry Christy in March of 1868 in the Cro Magnon cave at Dordogne, France. The remains were those of 3 adult males, 1 adult female, and one infant. 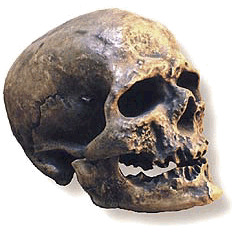 Cro Magnon probably developed in asia, migrated to europe, and co-existed with Neanderthal man for a time (eventually they drove the Neandertals into exctinction) and flourished in southern Europe during the last glacial age. In Europe, by convention, Cro-Magnon times (the Upper Paleolithic) ended together with Pleistocene 11,000 years ago. They were tall like modern humans, their skull had no brow ridges, was thin, rounded, with a high forehead, with a projecting chin. Average brain size:about 1,350 milliliters (same as today). As their oral anatomy were identical to modern humans, they could probably speak. They were our ancestor. Cro Magnons are associated with the Aurignacian culture, (occurred between 38,000 and 22,000 years ago) and hunted mainly with spears, (bow and arrows were later developed). Cro Magnon made tools from blades of Flint stone, used for preparing animal skins. Significant innovations was pierced shells, tooth and bone pendants used for body ornamentation. 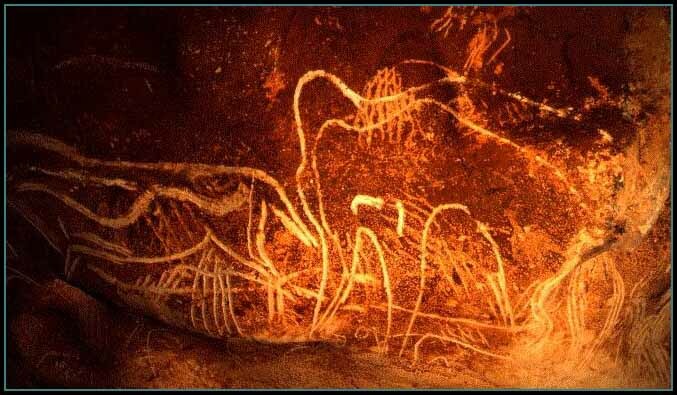 Their art extended to Venus figures, ritual statuettes of bone, and they made outline cave wall drawings of wolly rhinos, mammoths, cave lions and cave bears. Cro-Magnon�s used colors like red, black and brown from different types of berries and other materials, like fire coal. Both Neanderthals and Cro-Magnon feasted on a wide variety of ungulate species including reindeer, roe deer and horse. But although the Cro Magnon belonged to a hunting culture, were semi-nomadic following the movements of the animals during the seasons, and sometimes made huts and dwellings constructed of mammoth bones and lined with limestone slabs, tooth analysis indicates that they were not as extreme carnivorous as Neanderthals, they probably ate a wide range products, including collected plants. Paleolithic (Old Stone Age) people hunted mammoths, as is evidenced by remains of the animals found together with tools, and may have contributed to the extinction of mammoths and other species. Cave paintings of mammoth made by Cro Magnons.